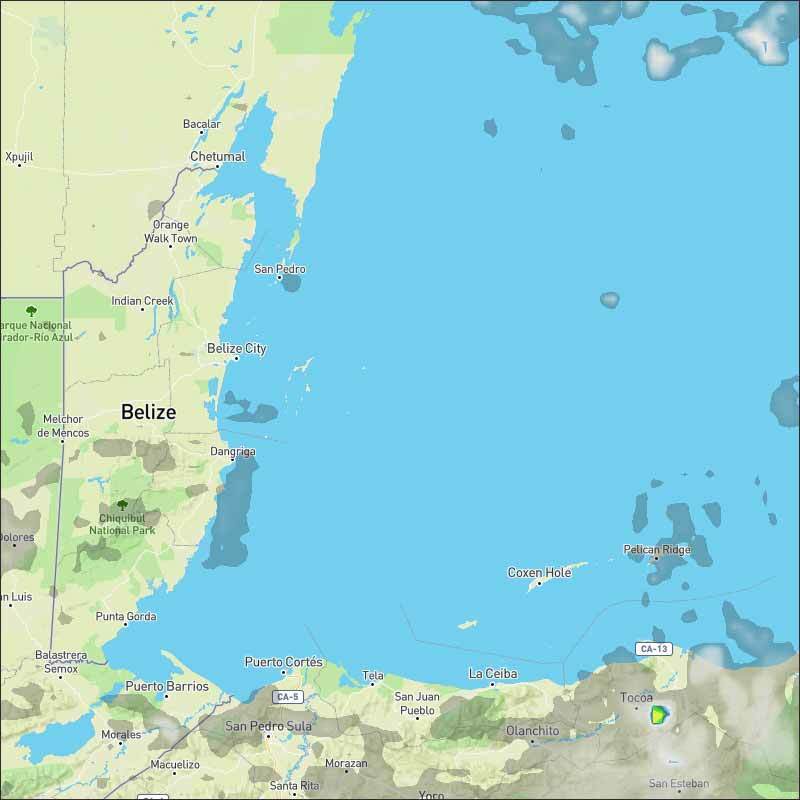 Belize NMS: Mainly fair and warm weather will continue. 24-hour forecast: Mostly sunny today and partly cloudy tonight with only isolated showers developing. General Outlook: (Sat. and Sat. night) Is for continuing mainly for and warm weather with only isolated showers developing. Tonight E 5-15 kts Light Chop-Choppy 2-4 ft ISOLATED SHOWERS MAINLY OVER THE SOUTH. Tomorrow E 5-15 kts Light Chop 1-3 ft ISOLATED SHOWERS. Outlook E 10-20 kts Light Chop-Choppy 2-4 ft ISOLATED SHOWERS. Shallow moisture in the NW Caribbean, low deep layer wind shear along with a divergent environment aloft are supporting heavy showers and tstms within 90 nm off the coast of Cuba. In the SW Caribbean, the EPAC monsoon continue to support scattered showers and tstms within 105 nm of the coast of NW Colombia, Panama and Costa Rica. Isolated showers are occurring in the northern Leeward Islands and the Virgin Islands being supported by diffluence aloft associated to an upper level low NE of Puerto Rico. A tropical wave moves over the central basin, however general hostile conditions across the basin associated with strong shear and dry air hinder convection at the time. See the waves section for further details. A new tropical wave is forecast to move across the Lesser Antilles tonight...a second wave will enter the E Caribbean Sun night. Otherwise, fresh to strong winds are forecast for the south-central basin through the weekend. A total lunar eclipse will occur on July 27, 2018. It is not going to be visible in Belize. The Moon will pass through the centre of the Earth's shadow. This will be the first central lunar eclipse since June 15, 2011. On Ambergris Caye this morning it's a beautiful sunny day with a calm sea around our barrier reef. 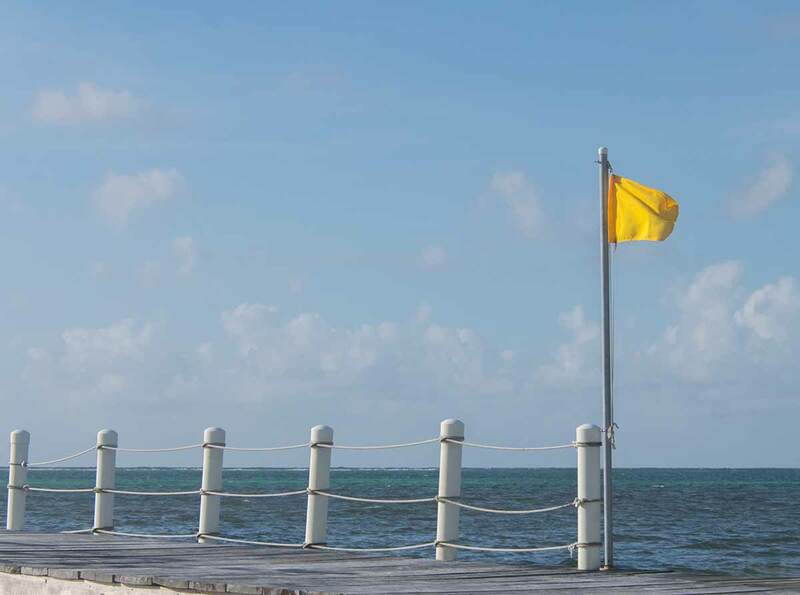 The wind is from the S-SE at 9 mph and our expected high temperature is 89 f. The Marine Reserve has a new system of flag color indicating currents at the reef. This Yellow means caution, Red is extreme currents and Green is calm.. There was some thin, high level cloud over Belize yesterday afternoon from the south, which caused a little rain in southern Toledo, but no indication of that this morning. The easterly Caribbean winds are producing chunky clouds as they cross over on to land, particularly along the southern coast line, these will move further inland later this morning. Looks like today will again be mainly sunny, but with a fair bit of white clouds, probably no rain.